It’s asparagus time again! I already wrote about my love of it – especially the green kind – last year, so naturally I was looking forward to its reappearance. We had a spring dinner on sunday with this lemony light asparagus dish and creamy labneh with roasted rhubarb as dessert. I tell you there is no better combination than asparagus and rhubarb! In case you’re no so familiar with asparagus yet (you should do something about that now!) or only have the odd white asparagus lunch once a year (Germans will know, you are obliged to, and common: it is worth it), know this: it’s easy to cook with and absolutely no fuss! Unlike white asparagus, the green one does not have to be peeled. In fact, it does not even need to be cooked, but is quite delicious raw. Use a potato peeler and shave the asparagus so that you get ribbons. They are delicious in any salad! Of course you can steam or blanch the asparagus, but my favourite way is to quickly sauté it in butter. It takes less than 5 minutes, adds a delicious nutty flavour and the asparagus remains a slight crunch – so good! The asparagus issue was settled. Maybe because it seemed all too easy, I got a little innovative with the sauce (I’m still not absolutely sure, whether this is a good thing). One thing was clear, I wanted it as lemony as possible. You can imagine what came to my mind next: a savory lemon curd! This might be nothing for the purists, but I reassure you, it really turned out nicely and rather sharp, which was what I was after. 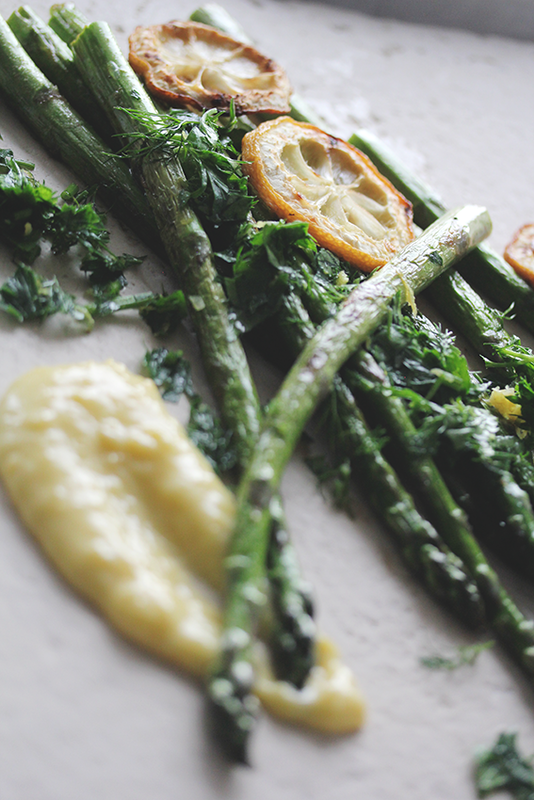 You can serve the asparagus with the lemon curd, the roasted lemon and the gremolata (that gremolata was possibly my favourite part of the dish!) all by it self as a light meal or a starter. 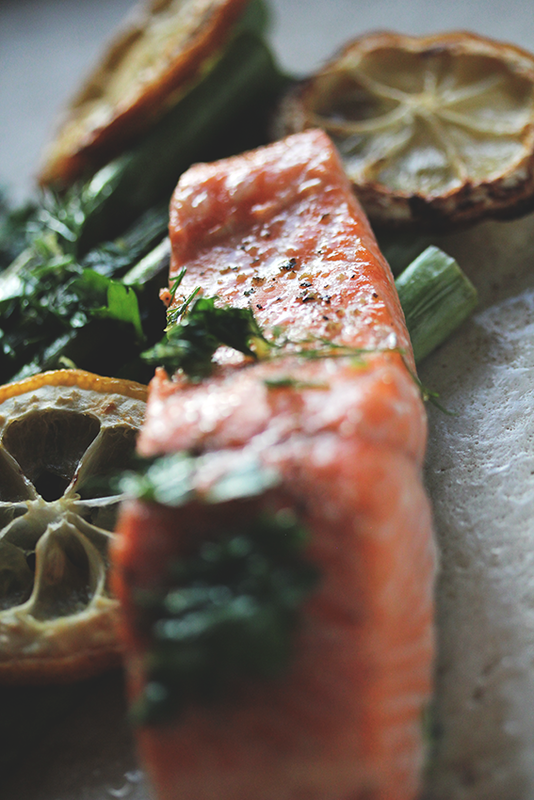 We had sea trout with it and I imagine that salmon would be a great addition as well. Even something like roasted chicken thighs might work well. Start with the lemon curd. Zest and juice the lemons. Put the juice and zest in a heatproof bowl or small saucepan, add the butter, stevia (you don’t want the curd to become sweet, but you’ll need a bit of sweetness to balance out the sharpness of the lemons. You may want to start with just 1 tbsp and add more later, if you find it to be too sharp) and a pinch of salt. Place the bowl over a pot of simmering water, but make sure that the bottom isn’t touching the water. Stir lightly until the butter has melted. Turn down the heat, if the mixture is to hot the eggs will curdle. Mix the eggs lightly and stir them into the butter mixture. Stir continuously for about 15 minutes. Don’t worry, this step takes its time. At some point the mixture should become thick and custard like. Remove it from the heat and stir occasionally as it cools. Taste and add some stevia or salt as needed. Preheat the oven to 160 °C. 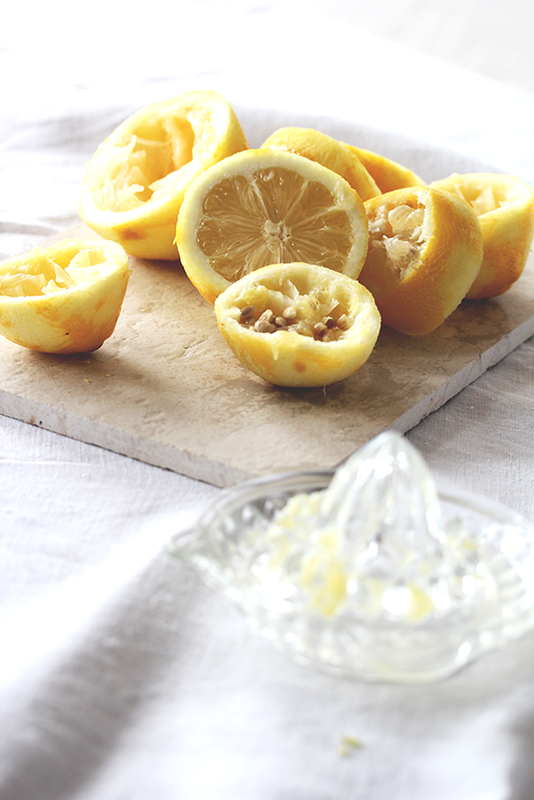 To make the roasted lemons, slice a lemon horizontally and remove the pips. Blanch the lemon in boiling water for 2 minutes, then drain and pat dry. Mix them with 1 tbsp olive oil and some salt and place them on a parchment-lined baking tray. Roast in the oven until they have dried for about 15 minutes, but be careful not to burn them too much. To make the gremolata, chop the herbs. Crush the garlic with the salt, mix with herbs, lemon zest and olive oil. If you make the fish, wash and dry the filet and cut it into four even sized pieces. Line on a baking tray, drizzle with olive oil and lemon juice and rub in some salt and black pepper. Turn the heat of the oven down to ca. 120 °C and roast the trout until it is just cooked trough, ca. 15 minutes. The flesh should have turned slightly opaque, but should not start to start to dry out. Chop of the though ends of the asparagus. Melt butter or ghee in a large pan and sauté the asparagus on medium heat for about 5 minutes. 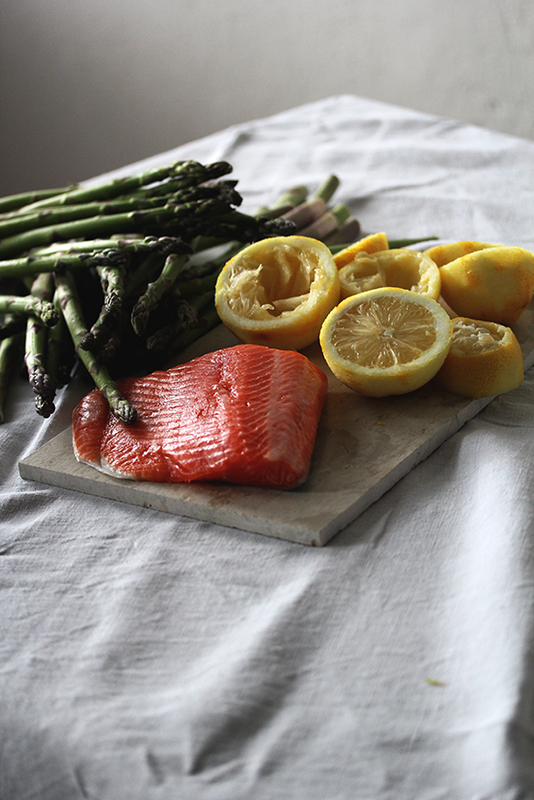 Assemble everything on a plate and enjoy!